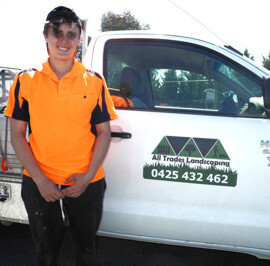 Setting her sights on a new career as a landscape gardener, Brittney Foley didn't realise how difficult it was for a young woman to be an apprentice in the industry. In spite of not having an employer who would take her on as an apprentice, she sought casual labouring work in the industry and ploughed head on into study. Brittney fast-tracked her study, attending three days a week at CIT and working as a labourer so that at the end of 2018, Brittney will have achieved her 3 year qualification in 18 months. Her tenacity and determination was recognised on the at the 2018 Construction Industry's Training Council awards where Britany was awarded the Meritorious Category for what Vince Ball, Executive Director of CITC called, 'Diamonds in the Industry' at a luncheon and awards function at the Canberra Southern Cross Club in Woden. Nobody was more surprised than Brittney as these awards are normally awarded to apprentices. The best news is she has now found permanent full-time employment. In even better news for Brittney, her full-time employment is going to become a partnership with her employer at the end of the year. They have so much work to do and Britany is being recognised as a hard, ethical and conscientious worker. Her soon to be business partner, an engineer and handy person, isn't qualified in horticulture or landscaping, so it will be Britany's qualifications and licensing which will be pivotal to the business. Brittney's determination and hard work at CIT, has seen her go from unemployment to business owner in less than two years. She has been recognised by industry for her hard work and is really happy and positive about her future.